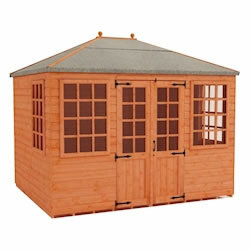 The Double Doors on these Summerhouses make them a versatile building. 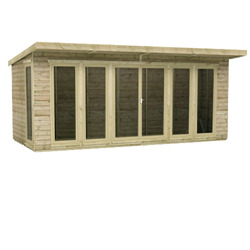 Suitable for use as your own personal garden retreat, home office, or simply as extra storage space. 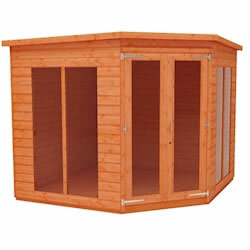 Available in a wide range of styles for you to choose the Summerhouse that is just right for your needs. 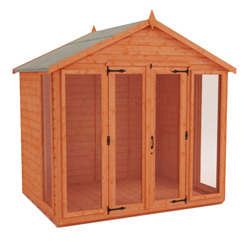 Our double door summerhouses offer the perfect relaxation getaway, with the added bonus of increased access – regardless of garden size. 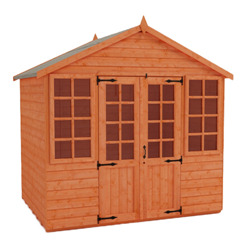 Our double door summerhouses are the perfect solution for anyone who suffers from poor mobility or simply wants a little more door space. These large, bright spaces are great for summer relaxing, undertaking hobbies, or simply storing things out of the way. 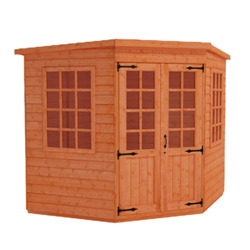 Manufactured from the highest quality pressure-treated superior grade 12mm finish shiplap cladding our summerhouses are built to last, as well as reducing the need for regular maintenance. 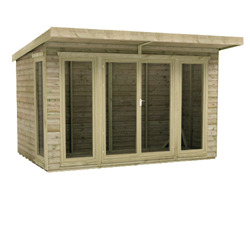 That’s why all of our summerhouses come with a minimum ten-year guarantee.